If ever a DVD release set a trap for a reviewer, this would be it—it's so easy to sound fatuous ("Potemkin's got a good beat, you can dance to it, I give it a 93"), stupid ("Dude, this movie *sucked*") or pompous ("The most important cultural achievement since the Gutenberg Bible"), because this is one of those movies that even if you haven't seen it, you've sort of seen it, because its influence is everywhere. Filmmaking and Communism reached Russia at about the same time, and the deprivations of the Revolution led the Russians to becoming the great film theorists—when they did in fact get to make movies, there was no getting around the strict political agenda set forward by the Party, because flouting it could kill more than just your career. What's kind of stirring, then, watching this movie, is what a grand pageant it is—it's a fantastically vital, visceral piece of filmmaking, on a sense of scale that's almost unimaginable now, made when film seemed to provide endless possibilities, and that nothing was out of bounds. The director, Sergei Eisenstein, is really the great man of early Soviet cinema, and this is his crowning achievement. He tells the story of the 1905 riots that led to revolution, focusing here on the sailors of the great battleship of the film's title—and you can see a raft of influences, and Eisenstein digesting them and making it all his own. The movie is made some sixteen years after the death of Leo Tolstoy, and you can almost feel Eisenstein taking on the mantle of the great Russian storytelling tradition; he's also got a keen sympathy for the terrors and deprivations of everyday life in Czarist Russia, and the first grand revolutionary moment here, the sailors complaining about the maggot-ridden meat they've been provided with for meals, is straight out of Upton Sinclair. Essentially, the whole movie pivots on a borscht riot—the men on board have had enough of exploitation, and they throw off their shackles, having nothing to lose but their chains. They create a sort of People's Paradise at sea; the ship-of-state metaphors are kind of inescapable, and Eisenstein seems even to be inviting them. The movie twins its sharp eye for social realism with a grand, almost expressionistic sense of composition—when you see the men in their hammocks, for instance, hung every which way in a cramped room and unbearably close together, it's like watching a Sheeler photograph set in action. (Throughout, in fact, the film has a fascination with form, and with machinery—it brims with gleaning wheels and turrets, pinions and pistons, almost a Valentine to the means of production.) So much of Potemkin's influence has to do with its formal elements, but it's kind of stunning to see the acting here too, as you can almost see the prevailing style changing before your eyes. Yes, the villains in classic melodramatic fashion favor, quite literally, twirling their elaborate moustaches; but Stanislavski and what would become Method acting are very much in the air, and no one in Eisenstein's cast goes in for the kind of grand emoting gestures, necessary and suitable for the stage but looking buffoonish to our contemporary eyes. Similarly, there are strains of the great nineteenth-century adventure tales here—the sailors shout "All for one! One for all! ", and it may be a function of the English translation, but they seem more in league with the Three Musketeers than with Lenin and Trotsky. The film is broken into five parts, and its signature image, which you're sort of waiting for from the jump, comes in the fourth of these—the Odessa Steps sequence is a paragon of epic filmmaking, and with images of violence that remain deeply unsettling. There's no getting around some of them: we see a child shot in the head by Czarist thugs, then stomped on, as his mother watches in horror before she's shot too. And before that baby carriage comes careening down the steps, the baby's mother is massacred as well—this juxtaposition of tenderness and terror is what makes so much of Potemkin so startling, and the kind of thing that gets lost in its many imitators (cf., the climactic shootout in The Untouchables). And it's not even an hour and ten minutes long, so even the most jaded and media-saturated among us can appreciate this unparalleled achievement without fear of boredom. Image Transfer Review: Obviously the medium was in its infancy when this film was made, and technical standards (aspect ratio, frames per second) hadn't yet been codified. Given the technical strictures faced by Eisenstein, then, this transfer is kind of a wonder&38212the film has been restored extensively and brought lovingly to DVD. You'll see occasional flickers and more than a few scratches, but this is unquestionably a definitive edition. Audio Transfer Review: No doubt, faithful dOc reader, you've been champing at the bit for the audio transfer review of a silent movie. What's here is in fact the original 1926 score for the film, in either 2.0 or 5.1—either sounds fine, and composer Edmund Meisel makes liberal use of the Marseillaise as the anthem for revolution. Extras Review: The film appears in two forms in this set: the first disc has it with newly translated English intertitles, while the second has it with its original Russian intertitles and optional English subtitles. 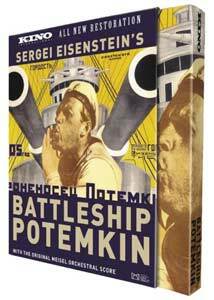 Disc One also has Tracing The Battleship Potemkin (42m:24s), a German production that looks at the various versions of the film that have been released, re-edited and bowdlerized over the years, due to parrying with Communism, censorship, carelessness and decay. It's a good watch, but the set could have offered more cultural and historical context, so it seems like something of a missed opportunity. Also on the first disc are three photo galleries: the first shows Eisenstein at work on the set; the second offers stills from deleted scenes and sequences; and the last is a collection of international posters. The accompanying booklet offers brief but useful notes on the film by Bruce Bennett. Superlatives get tossed around too easily—every week seems to bring another movie of the year, every year an instant classic, if you believe the pull quotes—but it's no exaggeration to say that no film has been more important to the history of the medium than Battleship Potemkin. What may stun you is what a rousing pageant of a movie it is, no tepid exercise in formalism or theory. It looks remarkably fine on this set, which couldn't be recommended more highly.